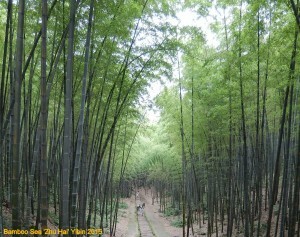 I had been thinking about visiting the Bamboo Sea (Zhu Hai) near Yibin for years. You know how it is: places close to home (in this case, three hours by road from Chongqing) never seem as exotic as those further away. 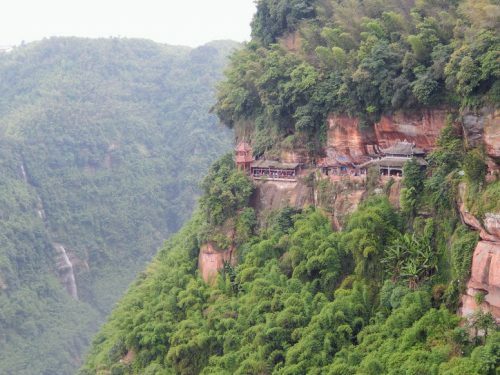 Nevertheless, when my friend Xiaojin who comes from that area offered to take me to this scenic spot, I jumped at the chance (click photos to enlarge). 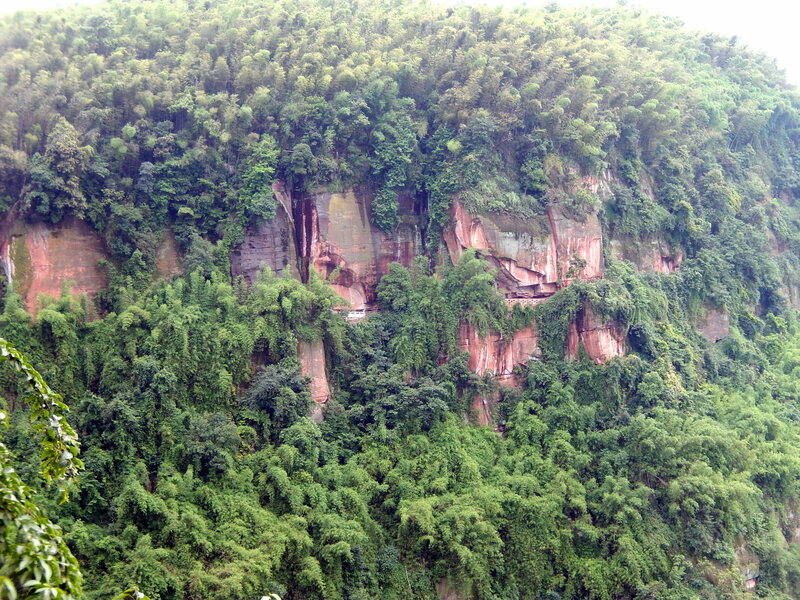 It was a pleasant, if unspectacular drive across the Chongqing/Sichuan countryside. Following the road up the plateau, entering through the West Gate, then winding through cathedrals of overhanging bamboo to a lookout where we stopped for a while. The view of the countryside below was very nice. Worth the trip. Continuing on to a hostel where we would stay the night. Xiaojin outlining the plan for tomorrow: down a few steep flights of steps, a walk along the edge of the escarpment with a view of the countryside below, then a gradual climb back up to the top where we would follow a track through the bamboo back to our hostel. 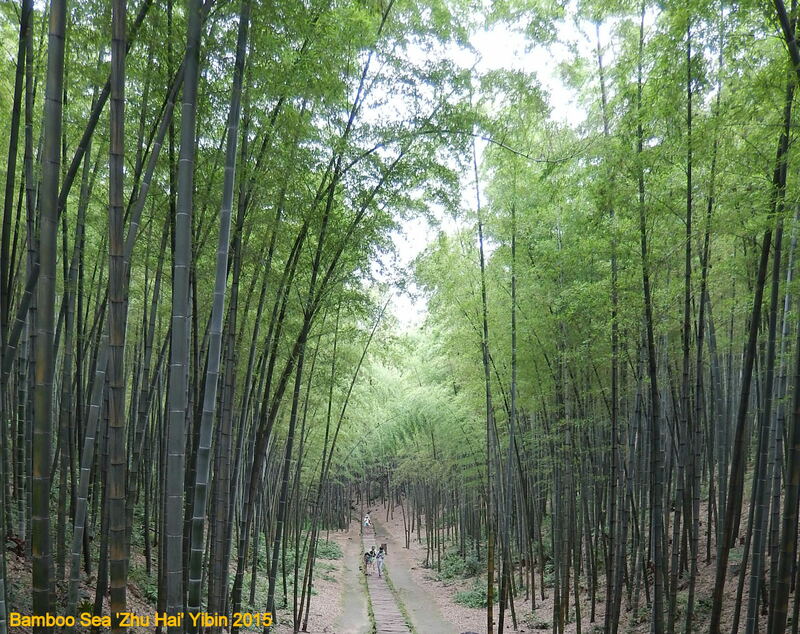 A sunset over the bamboo, an evening meal of bamboo shoots and forest mushrooms washed down with tea, then a stroll across a large carpark to see the Big Dipper and the North Star in a clear night sky. A couple of local beers and then off to bed for an early night. Breakfast at 0600 hours tomorrow. Xiaojin was right, the steps were steep. Over the edge, but no view yet. Just wall-to-wall bamboo hiding the precipice. Interesting enough, but nothing to write home about. Then we levelled out, and turned a corner. 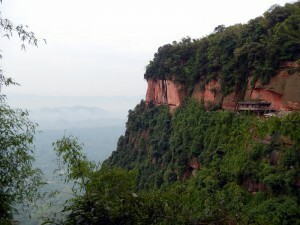 A view to the right across a deep valley to a bamboo-topped ridgeline above a yellow-orange cliff-face. 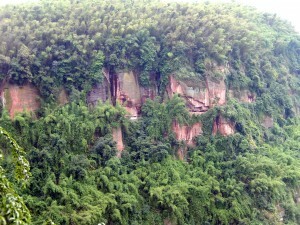 A hanging garden of vegetation clinging to the edge of the rampart. Spectacular. To my left, a similar massif. 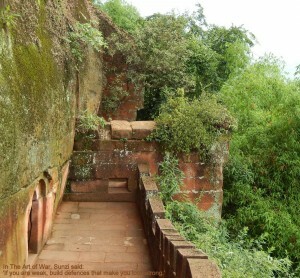 A sheer sandstone wall with a path cut into a sedimentary layer. 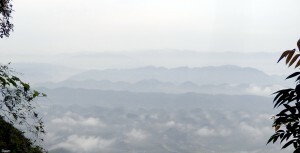 Stone blocks assembled into what looks like a defensive structure rather than a barrier to a steep drop to a most unusual topography below: small rounded hillocks, looking like green bubbles poking up through a rising tide of a mist covering rice paddies in the gullies between them. 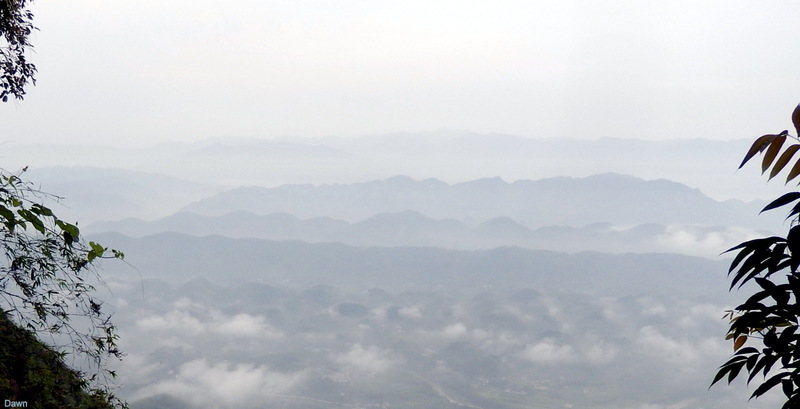 In the middle distance, blue-grey ridgelines merging into a hazy horizon. Oh My God. And my day is just beginning. 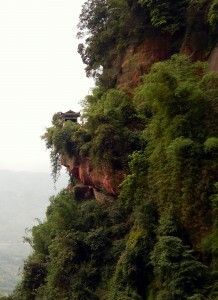 Viewing platforms and pavilions anchored to the precipice. Traditional styling. Soaring eaves reaching out and up. Passing a reclining Buddha cut into the wall, on his way to Nirvana. Then a towering Goddess of Mercy, too busy meeting the needs of her supplicants to rest. 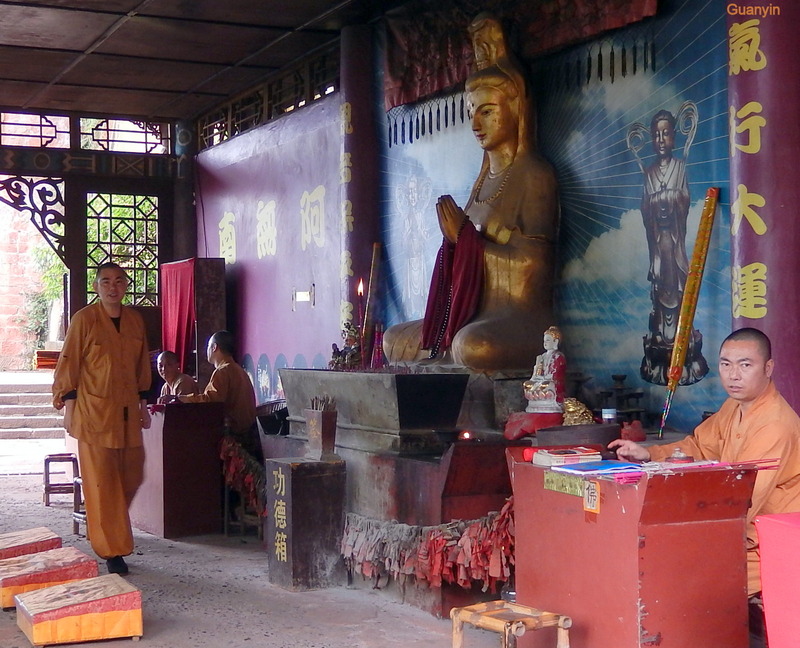 Four monks with mustard robes, gongs, and a money box – selling superstition. 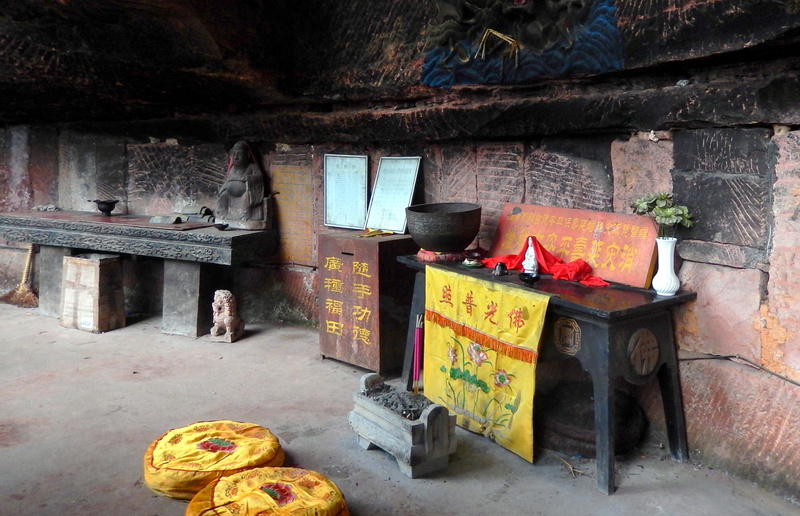 A humble Taoist shrine maintained by local peasants – genuine piety. Stopping to enjoy the moment. Drinking Chinese tea and savouring the view as well as the taste. It is all a bit too much – I can’t believe what I am seeing. How come this place is not on an international tourist circuit? Moving along. 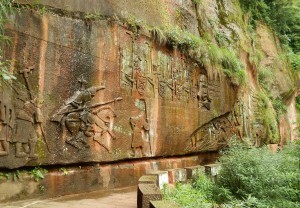 Bas-relief figures carved into the yellow stone wall. Warriors and wise leaders. The stone blocks organised into obvious defensive structures. Xiaojin interpreting the characters chiselled into the rock-face: “if you are weak, build defenses that make you look strong,” and, “Hide your purpose, choose a different path to reach your goal.” Maxims from military strategist Sunzi’s The Art of War (500BC). Finding caves able to be sealed off when under attack. Defences with gaps for shooting arrows through. Then realising why. Chinese history records the ebb and flow of occupying armies. 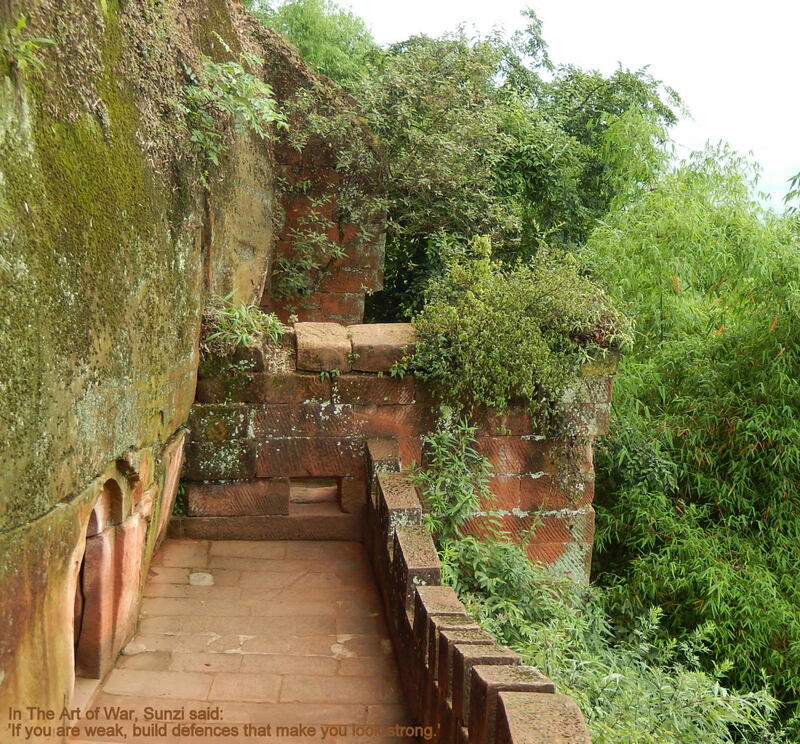 For example, in the mid-13th century, Khublai Khan’s army moved through here on its way to attack Dali and occupy parts of Burma, Thailand and Vietnam. Local people once again retreating up the mountain for safety behind prepared defensive positions. Xiaojin talks quietly and I listen. I am overwhelmed by scenic beauty, man’s adaptation to his environment, and a long history that few people know in depth. What a privilege. Crossing a small lake on a bamboo raft as we make our way back to the hostel. Getting lost in the Bamboo Sea expanse on the top of the plateau when we attempt a short-cut which leads us dangerously close to an unseen precipice. The echoing wind warning us to turn around and retrace our steps. And on our way home to Chongqing, after exiting the Bamboo Sea by the East Gate, we visit a Qing Dynasty feudal mansion with its 100+ rooms and barracks for soldiers. The head man used to be the government’s representative in these parts; exercising control over life, death and taxes in his personal fiefdom.